This was first posted in December 2011 on my old blog. Opening Sentences: 9 p.m. in Brooklyn, New York. The vroom and shush of traffic outside the bedroom window while Mama turns the pages of a sleepytime tale. 9 p.m. in Brooklyn, New York is… 10 p.m. in Puerto Rico. Sweet rice, fruit ice, coconut candy. Papa playing congas, Tio his guitar. 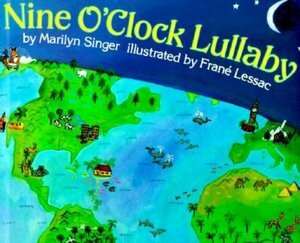 Synopsis: The story goes all around the world, showing what is happening in different families in different countries at the same moment that Mama is reading the sleepytime tale in Brooklyn, New York, culminating in being back in Brooklyn on the last page. Why I like this Book: It has always fascinated me to think of what is happening in other places around the world while I’m waking up, or going to sleep. This shares this fascinating concept with children in language they can understand, with illustrations that are detailed enough to give a real feeling of the different cultures, while still looking like something a child might draw. This adds to the appeal of the book for me. This has become one of my favorite picture books since I discovered it this summer. Activities/Resources: There are so many opportunities for learning in this book! The author’s website gives an excerpt from the book, and information about the author that children could find interesting. The illustrator’s website includes teacher’s notes for many of his books – scroll down for Nine O’Clock Lullaby. The Children’s Literature and Social Studies wiki also has suggestions for lesson use of the book, as does TeacherVision. Availability: The book is available in paperback format from Barnes and Noble. # 5 in Perfect Picture Book Fridays. See all this week’s Perfect Picture Books at Susanna Leonard Hill’s blog, or find the entire listing at the “Perfect Picture Books” section of her website.